Here on the internet, the “free speech” card is usually only played when someone gets in trouble for something terrible they said on Reddit. Surprisingly, that’s not actually what America’s founding fathers intended when they came up with the Constitution and its First Amendment. Now, The Thomas Jefferson Center has turned to Indiegogo to raise money for a traveling installation that will teach people about what the First Amendment is actually for. 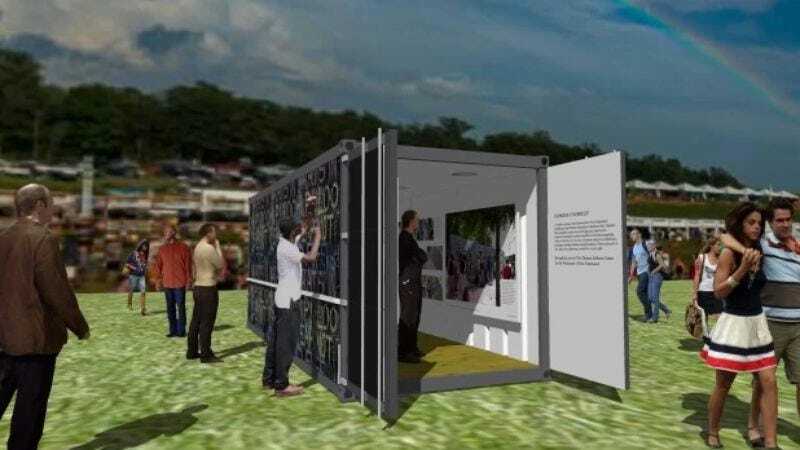 The Thomas Jefferson Center has dubbed its creation “A Mobile Monument To The First Amendment,” and it’s trying to raise a total of $15,000 to buy a shipping container that it can convert into a solid cuboid of education. The interior will be able to house rotating First Amendment-related exhibits, and the exterior will be covered in over 400 square feet of chalkboard so that visitors can express their love of free speech however they’d like—even if it’s dumb and annoying and the sort of thing you should be ashamed of writing on the outside of a traveling monument. As of right now, the campaign has raised $7,640 of its $15,000 goal, with eight days remaining. You can donate to the project—or learn more about it—at its Indiegogo page.